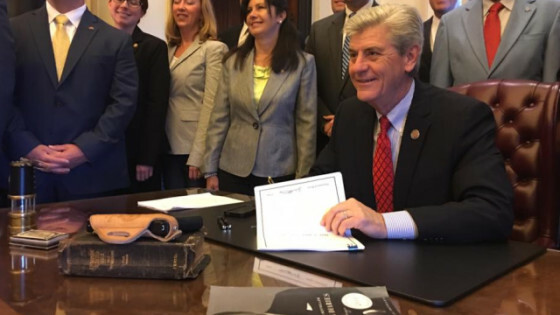 On April 15th, 2016 Governor Phil Bryant of Mississippi signed HB 786 with his tattered bible and gun sitting next to him. Mississippi now joins a short list of constitutional carry states that allow citizens to carry a concealed handgun without requiring any licensing or permitting. Today I signed House Bill 786 to give churches the right to protect themselves from those who would harm them while they worship,” Governor Bryant said in a statement. “I’m a strong supporter of Second Amendment rights and will continue to advocate for your right to keep and bear arms. Bloomberg's gun control groups flooded the state with advertising to attempt to stop the bill from passing but it was in vain. The state representatives and senators heard their constituents and a good law was passed. Gov. This is absolutely great. You have done the job obama SHOULD be doing. This action by the Governor has given me a lot more hope. Thanks for leveling the field, All the bad guys carry concealed, now the citizen can too, without paying a fee for it. Now I don’t have to leave my gun in the car everywhere I go. This and the religious freedom bill make me proud of both the Governor and our Legislators. Thank you Governor Phil Bryant !!!!!!! !